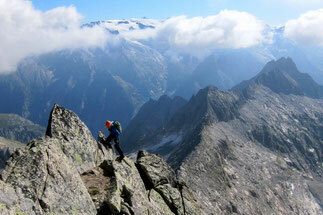 The climbing on the south ridge to Schijenstock is long and offers great rock quality. On the top of this three-thousand-meter peak you will be rewarded with an extraordinarily beautiful view to the glaciars of Dammastock. Recommended climbing level: 4a and higher. 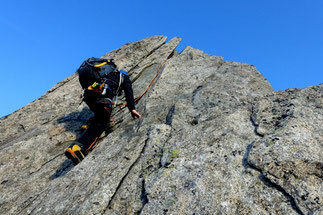 Climbing Grosser Diamantstock over its east ridge is one of the best climbs in Bächlital. 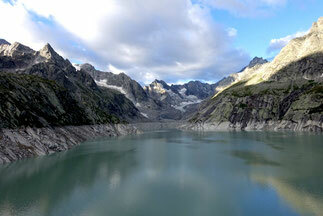 Early in the morning you walk over rocky slabs and glaciers up to the start of this magnificent climb. Recommended climbing level: 4c, long alpine tour. At Furka you find many classic climbs in best granit rock: ESE ridge on Gross Furkahorn (4b), Schildkrötengrat on Chli Bielenhorn (4a), Gross Bielenhorn SE ridge (4c), Strahlengrat (3b), Gletschhorn south ridge (4a), etc. Recommended climbing level: 3b and higher. Do miss here on my website your climbing tour of desire? 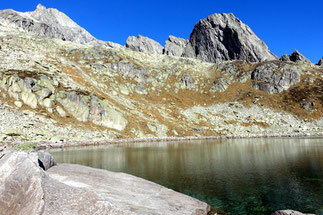 Do you dream of climbing one of the granite peaks in Bergell like Fiamma or Badile north ridge, or south ridge of Trotzigplanggstock or the traverse of Gelmerhörner in Haslital? If so, don't hesitate to contact me.